The Panzer 36 stainless blade is meticulously hand satin finished in the grinds and mirror polished on the flats. Panzer 36 is a martensitic stainless steel with high hardness, high wear resistance and good corrosion resistance. It is cross rolled in production to cancel out residual stresses from the manufacturing process. 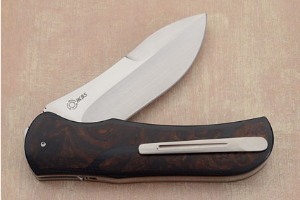 It has only recently begun being used by knifemakers and has gained significant acclaim by South African makers, where it has quickly found popularity. 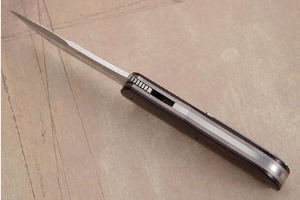 The blade has been hollow ground for an easy to maintain edge. This accentuates the unique, crisp grind lines. The thumb ramp has been fileworked for a secure thumb purchase. 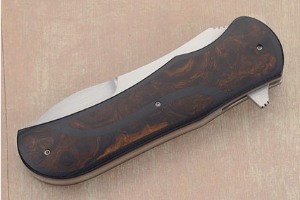 Andre inlaid exhibition grade ironwood into the black G10 scales. Scales are set on anodized titanium liners. 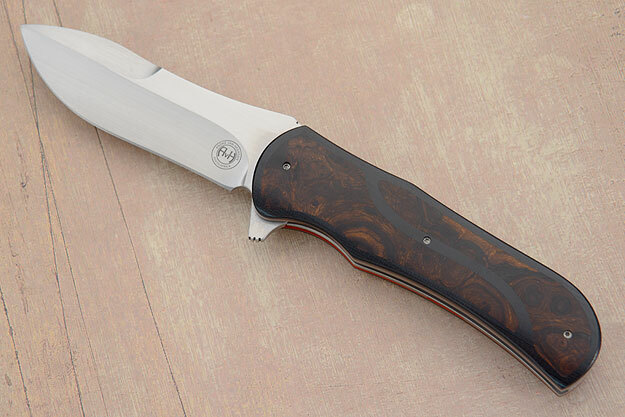 The blade is perfectly centered and has an incredibly smooth action due to the IKBS (Ikoma Korth Bearing System) pivot system. This mechanism, which was originally designed to fit balisong knives, uses ball bearings to create exceptional action with virtually no blade play. 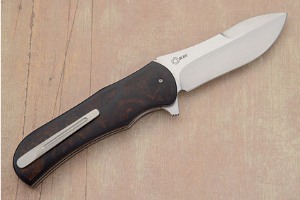 This knife is easily kept close at hand when worn using the tip-up titanium pocket clip. Excellent fit and finish throughout! 0.02734375 0.02734375 27.34375 27.34375 Main VPCart Include (shop$db.asp) Completed. 0.08984375 0.0625 89.84375 62.5 Header Started. 0.35546875 0.10546875 355.46875 105.46875 Trailer Started. 0.54296875 0.1875 542.96875 187.5 Trailer Completed.